Relegation battle, what relegation battle? That was the message from Craig Hignett who tomorrow will look to add more distance between Hartlepool United and the Football League’s bottom two. I’m not bothered about what’s below us. What I’ve seen of us, I’m confident. 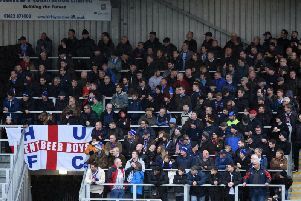 Pools clinched a crucial 3-1 victory over Dagenham & Redbridge at Victoria Park to move nine points clear of the seemingly-doomed club and seven points above York City. With Hignett taking his side to Newport County for the first of three games in hand on the bottom two, the manager’s desire to look up the table rather than down it, has been justified. “What battle?” smiled Hignett when asked if Pools were winning the battle for survival. “I’ve always been looking up, I’m not bothered about what’s below us. What I’ve seen of us, I’m confident. “I always have been since day one and given a bit of time they will be all right. “I’m not saying we are going to be world-beaters but I don’t think we are not far away from being a really good side in this division. Pools can move above Stevenage with a draw at Rodney Parade tomorrow night while a win would move them to within a point of Yeovil in 20th and three shy of the Welsh outfit, who are 18th. “The amount of points we have, I’m looking at the next team above us,” said Hignett. “We’ve just caught Stevenage, above them it’s Yeovil, who are on a decent run. For all Hignett’s optimism - and that’s always been part of his nature - he admitted he was not totally blind to the threat of the drop. But he said as soon as he’d seen his players on the training ground he knew he had talent tp work with. “It was always a possibility [relegation],” said the boss who is confident Pools can . “But that was only because when I came here, I knew some of the players, but I didn’t know them all. “Like I say though, apart from Bristol Rovers, we could have won all the games and we should have. “Notts County, how we lost it? I don’t know? Luton away? We were the better team. “Once I’d seen what they were like, the first two or three days, I was confident once we got them organised and playing the way I want them too that we’d be all right. “Bristol was a blip, even the second half there we were all right and could have scored two or three.